Toyota Material Handling Australia (TMHA) introduces a versatile new range of reach trucks designed to operate on outdoor surfaces. TMHA's BT & Raymond national sales and product manager, Dean Watson explains that the new BT Reflex O-Series RRE160R adds a new dimension to reach truck capability by combining the space-saving benefits of a narrow-aisle reach truck with the indoor/outdoor flexibility of a rubber-tyred counter-balance forklift. TMHA’s BT Reflex O-Series reach trucks have a ground clearance of 145mm and super-elastic tyres. The increased ground clearance allows the reach truck to operate on rugged, loose surfaces while the specialist tyres provide secure grip on wet or high-temperature asphalt. Designed to deliver maximum flexibility, increased productivity and reduced costs, the RRE160R reach truck is ideal for hardware and garden stores, construction companies, dairy and farm producers, and warehouse operators. 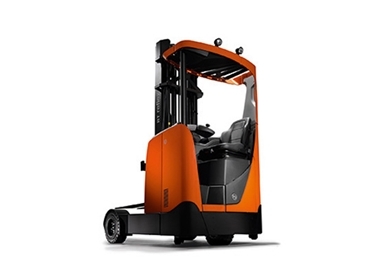 Mr Watson says the BT RRE160R model continues to offer top-level handling performance when working as a traditional reach truck in racking systems. Based on the class-leading BT Reflex R-Series model, with the wheel and gearbox configuration adapted to allow for effective work on outdoor surfaces, the BT Reflex O-Series has a payload capacity of 1600kg and lift heights up to 7500mm. Special features include BT's unique Transitional Lift Control (TLC) system for fast, secure working at height, an advanced driver cab with the BT 'total view' concept, powerful AC electric motors and 360-degree steering. Toyota Material Handling Australia offers a one-stop shop solution for materials handling needs, stocking a comprehensive range of Toyota, BT and Raymond forklifts and warehouse equipment. TMHA operates a national network of 15 company-owned service centres and more than 270 mobile service vans.